We know Iran’s nuclear secrets now. Let’s make the most of them. Israeli Prime Minister Benjamin Netanyahu revealed a treasure trove of secrets on Monday about Iran’s hidden nuclear activities. But it would be a waste of this extraordinary intelligence to use it as a pretext for American withdrawal from the Iran nuclear deal. Much better to use it as a pressure tool to squeeze Tehran. The Israeli intelligence coup should open the way for a much smarter U.S. campaign to isolate Iran and tighten the deal — and bring Europe, Russia and China along in a common push for a better agreement. This approach would keep the international community together and avoid handing Iran the propaganda victory that unilateral U.S. withdrawal would provide. The bold Mossad operation to grab the files in Tehran in January has caught the Iranians red-handed. Now let them squirm awhile, as the international community sifts the evidence of Iranian deception. Acting through the International Atomic Energy Agency (IAEA), the world should demand answers about the issues framed by the harvest of secrets: Why did Iran repeatedly lie about its past nuclear activities? How did it shape its program of deception? What stronger provisions are needed to make the 2015 agreement real and binding? Skeptics have argued that the captured Iranian documents only confirm what the U.S. concluded in a 2007 National Intelligence Estimate — that Iran had an aggressive bombmaking program that it halted in 2003. “I didn’t see anything [in the new documents] not covered in the unclassified KJs [Key Judgments] from the 2007 NIE,” argued Thomas Fingar, who as chairman of the National Intelligence Council oversaw the estimate. The skeptics are right that, despite Netanyahu’s theatrical presentation, the documents aren’t a smoking gun that shows Iranian violation of the nuclear agreement. But they do provide a ton of new information about Iranian lying, cheating and deception. Above all, they shatter Supreme Leader Ayatollah Ali Khamenei’s claim that Iran has never pursued nuclear weapons. Sorry, Mr. Leader, but the documents show otherwise. Rarely have a leader’s lies to his people and the world been clearer. The Israelis made off with a veritable encyclopedia of secrets that the Iranians had stashed in big, refrigerator-­like safes in a warehouse in the Shorabad district of Tehran in 2017. 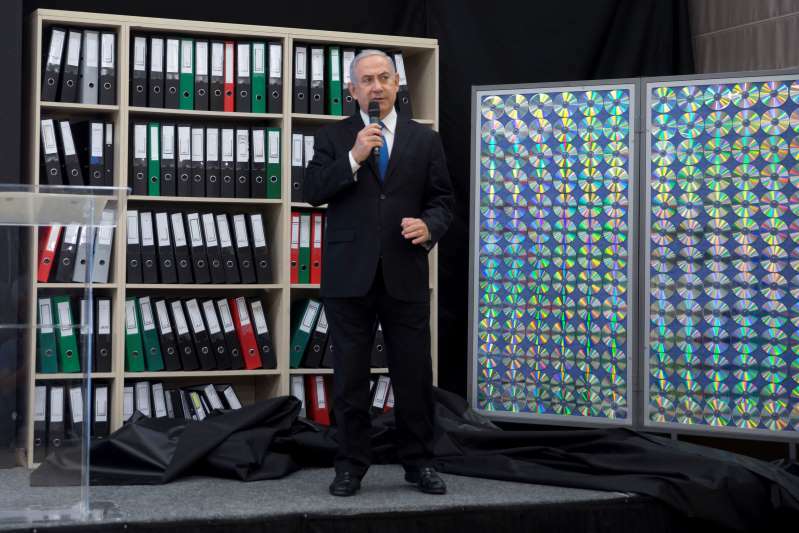 Netanyahu said the haul includes 50,000 pages in notebooks and folders, and 50,000 more files contained on 183 CDs. The sample he showed Monday night included blueprints, charts, spreadsheets and simulation results. U.S. and Israeli officials familiar with the documents say there’s far more Netanyahu didn’t disclose — revealing Iranian research sites, key scientific and technical personnel, and other information that should allow much better insight into the Iranian nuclear effort — and make it easier to strengthen and enforce the 2015 agreement. The hottest items Netanyahu revealed were the 2003 quotes from top Iranian officials about how they intended to continue secret work after the official program, called “Project Amad,” was stopped. “Work would be split into two parts: covert and overt [dual use],” said a document citing orders from Ali Shamkhani, who was then minister of defense. “The general aim is to announce the closure of Project Amad. . . . Special activities will be carried out under the title of scientific know-how developments,” said Mohsen Fakrizadeh, a physicist who ran the Amad effort and now heads the Defense Ministry’s Organization of Defensive Innovation and Research. Fakrizadeh is a key figure in any Iranian bombmaking effort, past or future, because he appears to have led Iran’s research into building a so-called neutron initiator to trigger the nuclear explosion. President Trump’s challenge is to use Iran’s new vulnerability, now that its secrets have been exposed, to get the tougher deal he wants. The problem with Trump’s strategy has been that it’s not clear what he intends to do, after withdrawing from the 2015 deal, to get a better one — assuming, that is, that he doesn’t plan to go to war against Iran. Now, Trump has a plausible rationale for working through the IAEA to hold Iran accountable, while gaining global support for curbing Iran’s missile programs and regional meddling. Trump’s choice on May 12 is clearer now: If he scuttles the deal, he risks isolating the United States, rather than Iran. If he instead uses Israel’s intelligence windfall to fuel a global pressure campaign, he may actually have a pathway for getting a better, longer-lasting and more enforceable agreement. Thanks to Israeli intelligence, Trump just got lucky on Iran. But will he be smart? Politics - U.S. Daily News: We know Iran’s nuclear secrets now. Let’s make the most of them.